Archives : IN THE SUPPORT ZONE - 19/08/2011. IN THE SUPPORT ZONE – 19/08/2011. Amidst global turmoil, our market too collapsed in line with other international markets. Bears had a free run this week, as the market went into a tailspin. There is so much fear on the street that the small trader is almost out of the market. The fall was so sharp that the market breached the low of the Belt Hold pattern and swiftly moved down to the much awaited support zone. The market has respected the support zone for now, but whether a price reversal occurs or not, will be known only at the start of next week. The situation is similar to what happened two weeks back, the Nifty had formed a Juji on the daily charts on Friday, and a bullish price reversal would have happened, had there been a white body candle above the Juji formation. But that was not to be. The situation is similar this week, as the Nifty after a gap-down opening on Friday, has formed a Spinning Top, which is also a neutral formation. If the prices open higher on Monday and a white body is formed, then a pull-back might be witnessed. The Sensex opened the week at 17015, made a high of 17035, a low of 15987 and closed the week at 16141. The Sensex lost 698 points on a weekly basis. Similarly Nifty opened the week at 5125, made a high of 5132, a low of 4796 and closed the week at 4845. The Nifty too closed with a weekly loss of 227 points. Both Sensex and Nifty have formed an Opening Black body Marubuzo on the weekly charts. This is a bearish formation and is on expected lines. Though the formation on the daily charts provides a glimmer of hope as there is a Spinning Top formation on the Nifty and a small black body formed on the Sensex. Both the formations are neutral and are questioning the existing down trend. If the prices open higher on Monday, and a white body candle is formed, then a price pull-back in the short term timeframe will be witnessed. Both the indices had left behind a Measuring Gap i.e. between Sensex 17664-17358 and Nifty 5323-5229. If we consider the start of the rally from Sensex 19131 and Nifty 5740, then the target for the downward rally was at Sensex 15891 and Nifty 4812. That target was achieved in the Nifty as it went upto 4796 and Sensex almost made it when it reached the low of 15987. One again on Friday, both the indices have left behind a gap between Sensex 16433-16287 and Nifty 4932-4893. Whether this is another Measuring gap or an Exhaustion gap will be known only in the next week. The market is well below the short term average of 20dma (Sensex – 17568 and Nifty – 5288), medium term average of 50dma (Sensex – 18064 and Nifty – 5429) and long term average of 200dma (Sensex – 18792 and Nifty – 5640). As a result the short term, medium term and the long term trends remain down. Both the indices are in their support zones and some of the oscillators (daily and weekly) are into oversold territory, a minor pull-back cannot be ruled out from this level. Assuming that the low made by Sensex (15987) and Nifty (4796) holds, one can expect a minor recovery of the immediate fall from Sensex 19131 to 15987 and from Nifty 5740 to 4796. The pull-back levels are 17188-17559-17930 for the Sensex and 5157-5268-5379 for the Nifty. If one considers the fall from a slightly higher degree i.e. from 19811 to 15987 for the Sensex and 5944 to 4796 for the Nifty; then the correction levels in that case will be 17448-17899-18350 for the Sensex and 5235-5370-5506 for the Nifty. Thus 50% of the immediate fall coincides with 38.2% of the intermediate fall forming a confluence zone. This zone is further strengthened by the presence of Measuring gap between Sensex 17664-17358 and Nifty 5323-5229. Thus there is a strong Resistance zone formed between Sensex 17358-17559 and Nifty 5229-5268. If we consider the entire fall from Sensex 21108 to 15987 and Nifty 6338 to 4796, then the Correction levels in that case are 17943-18548-19152 for the Sensex and 5385-5567-5749 for the Nifty. The 38.2% of the entire fall matches with the 61.8% of the immediate fall and 50% of the intermediate fall, thus forming a strong confluence zone. This zone is further strengthened by the presence of the 50dma. Thus we have a very strong second Resistance Zone between Sensex 17899-17943 and Nifty 5370-5385. From a broader perspective the market is correcting the Sensex rise from 13219 to 21108 and Nifty from 3918 to 6338. The correction levels in that case are 18094-17163-16233 for the Sensex and 5414-5128-4842 for the Nifty. The 61.8% of the above mentioned rise coincides with the 38.2% level of the entire rise from 7697 to 21108 for the Sensex and 2252 to 6338 for the Nifty. The 38.2% level falls at 15985 for the Sensex and 4777 for the Nifty. There is an intermediate bottom formed at Sensex 15960 and Nifty 4786. This is further aided by the 200 WMA which is at Sensex 16122 and Nifty 4835. This helps in forming a strong Support zone at Sensex 15960-16233 and Nifty 4777-4842. The Bears have pushed both the indices into this support zone. This support zone will be tested thoroughly this week. Both Sensex and Nifty had given a weekly Bearish Head & Shoulders breakout and after that the Bearish Descending Triangle also got completed. 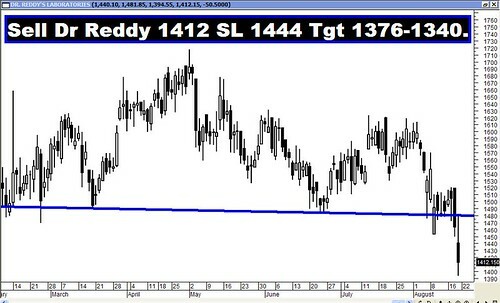 The target for Bearish Head and Shoulders falls at 14651-13928 for the Sensex and 4357-4143 for the Nifty. The target for the Bearish Descending Triangle falls at Sensex 13952 and Nifty 4200. Majority of the oscillators are in Sell mode, while some are in oversold territory. MACD and ROC are both in negative territory and both continue with their Sell signals. RSI is at 22 and is in oversold territory. The Stochastic oscillator too is in oversold territory as %K is at 8. Directional Indicators continue in their Sell mode. ADX has increased to 38 suggesting that the current downtrend is extremely strong. The Bollinger Band continues with its Sell signal. Money Flow has moved out of the oversold zone to 22 but still is in Sell mode. The other lead indicator OBV continues with its Sell signal as it continues to make lower top, lower bottom formation. Nifty O.I. PCR is now nearing oversold levels at 0.78. Call writing for the next month series is seen at 5000 strike price and Put writing is seen at 4800 strike. Huge addition in open interest is seen at 4600 Put. One can expect the Nifty to find resistance at 5000 levels and if the support at 4800 is breached, then the next support will be seen at 4600. For the week ahead, Sensex will find Support at 15868-15600-15332 and will find Resistance at 16546-16957-17373. For the week ahead, Nifty will find Support at 4743-4649-4538 and will find Resistance at 4970-5097-5232. All the recommendations reached their targets with the exception of Bata, which just missed the target. The Star performer of the week was Jubilant Foodworks, which went up by almost 12%. This week is expected to be very volatile and hence Pair Strategies are suggested.